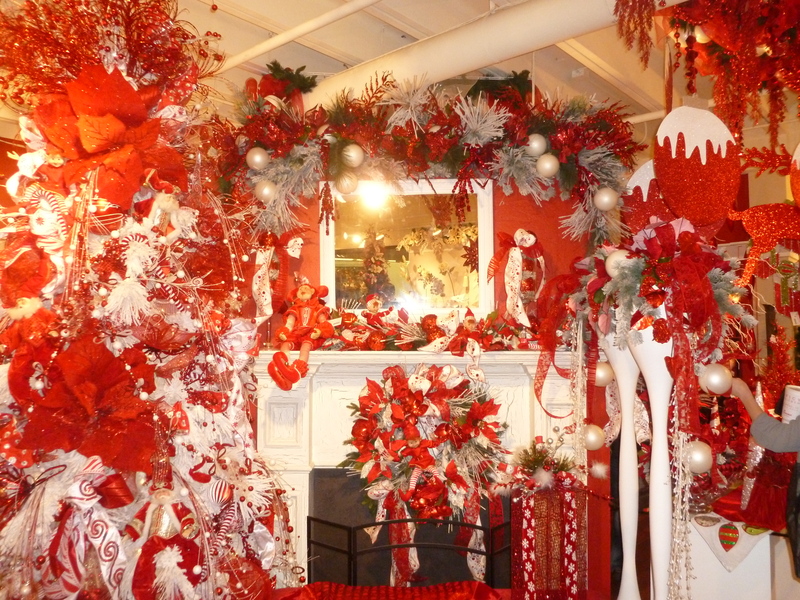 Christmas wreath is hung by ribbon on a curtain rod. 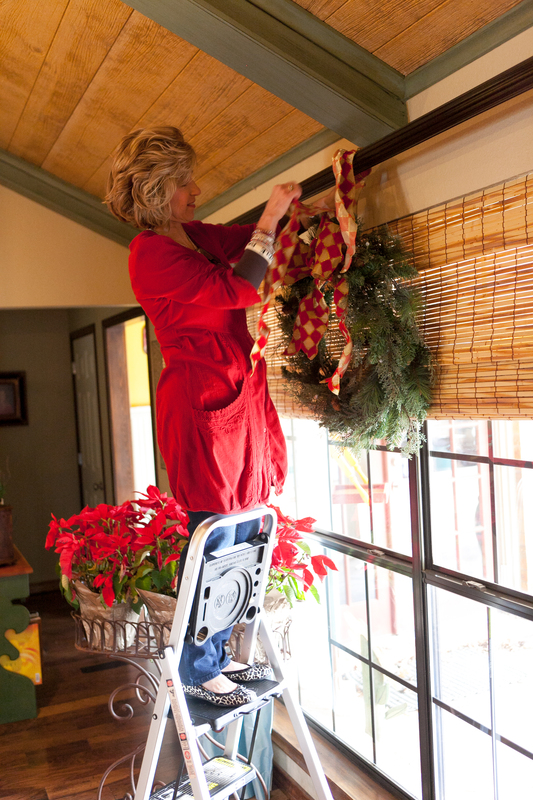 Kathy completes the decorating with a matching bow. 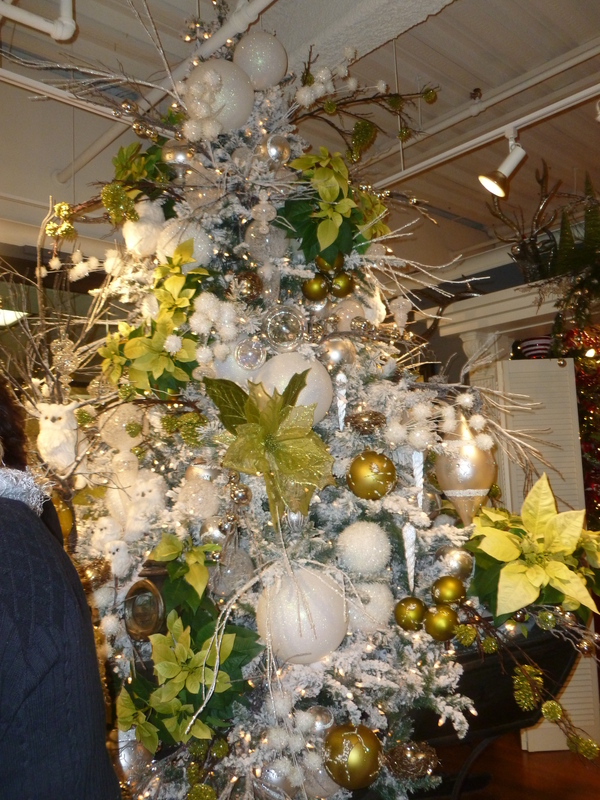 The French Country Christmas theme is a perfect compliment to Kathy’s home decor and personal style. 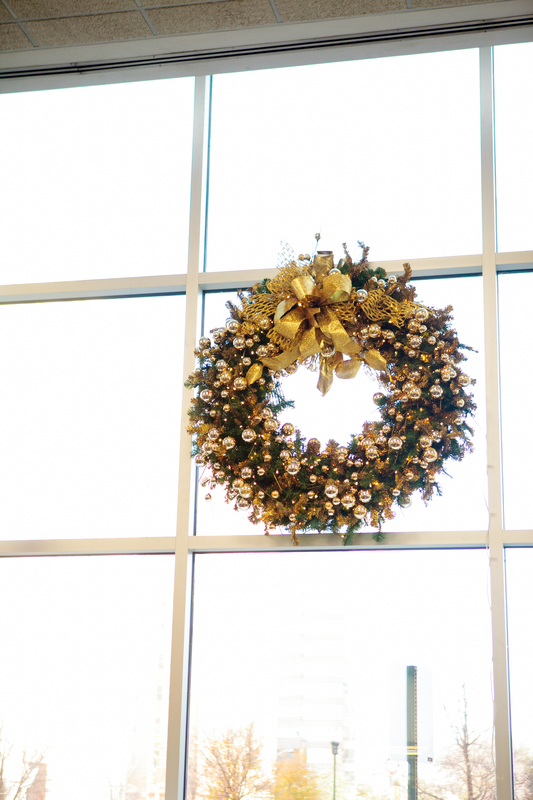 The Christmas Wreaths adorning the windows add a finishing touch. 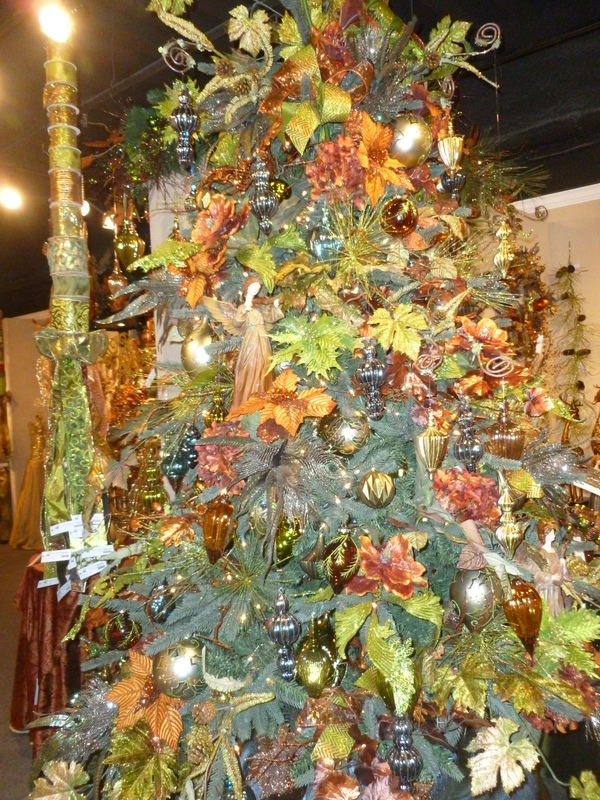 Faux garlands, Christmas trees and greenery take all the mess out of decorating with fresh greens and can be reused from year to year. 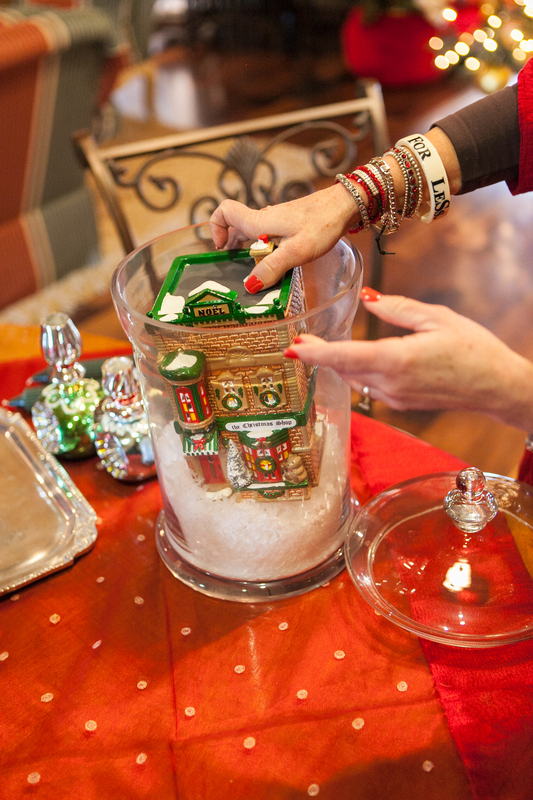 For a quick and easy Christmas centerpiece, feature a special Dept. 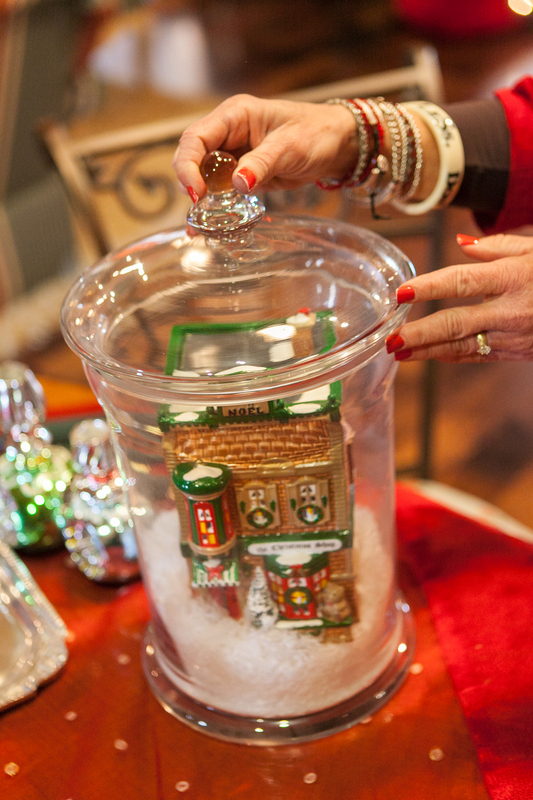 56 Village piece in a glass jar. 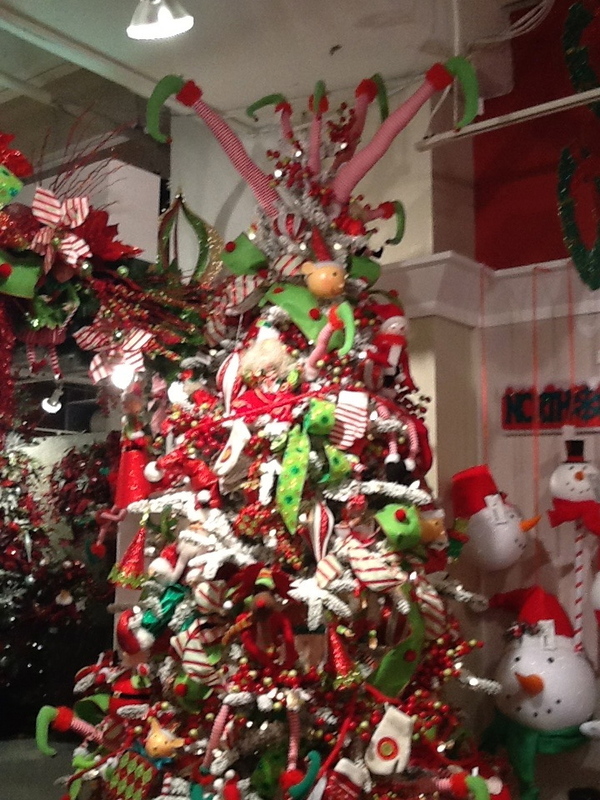 Kathy chose the Christmas Shop in honor of our store Miss Cayce’s Christmas Store in Midland. Choose a jar large enough to hold your Dept. 56 village building and add handfuls of faux snow. 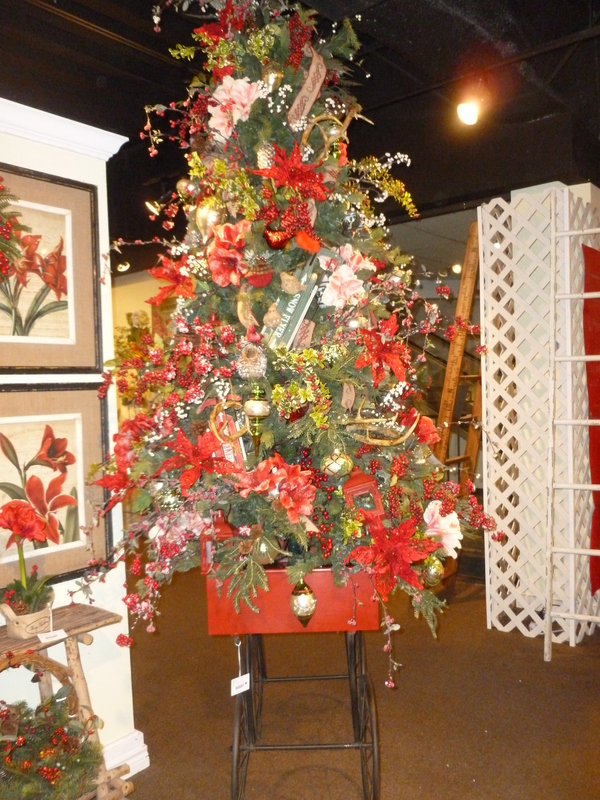 The Christmas Shop honors our partnership for the last 29 years! Place the building in the jar, settling into the snow. Top it off with the glass lid. 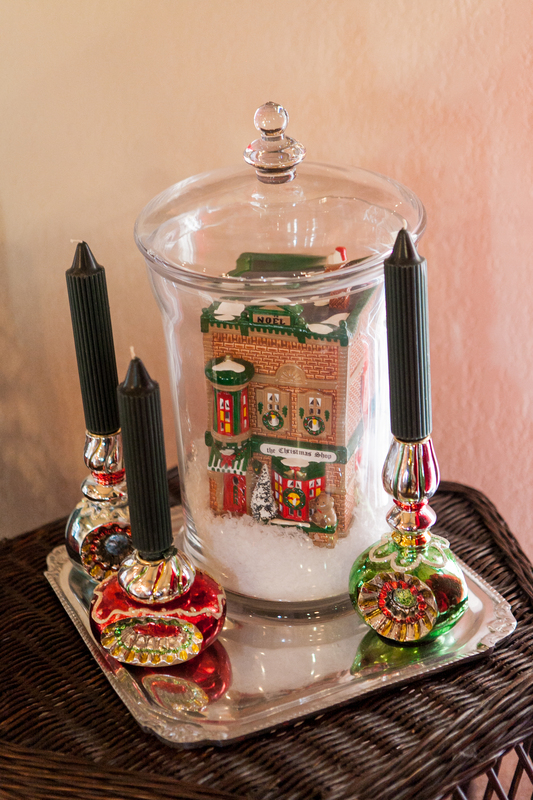 The Christmas centerpiece is completed by placing on a silver tray and a set of Christmas ornament candle sticks. Each year we go with ideas in mind and then are also open-minded to be inspired. 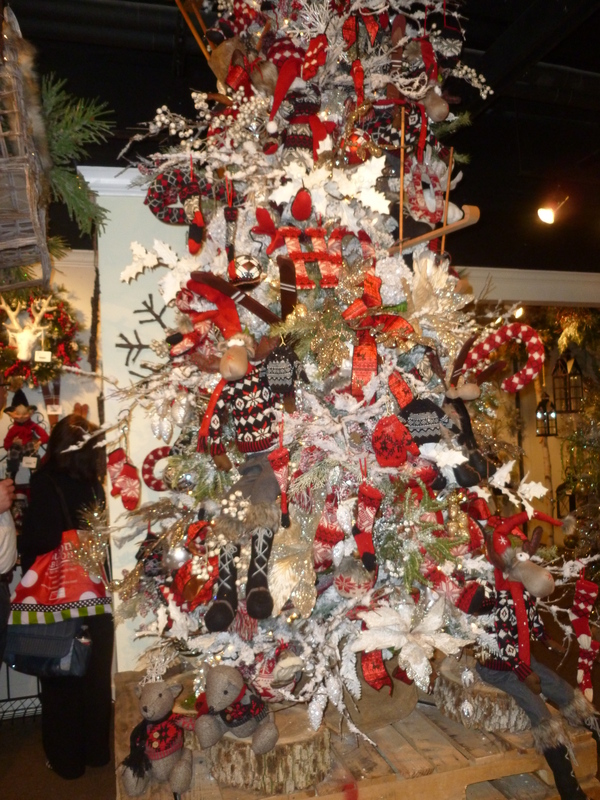 We look at magazines, home decor and holiday to see color and style trends and look for new ideas to use in display and design for Christmas decorations! 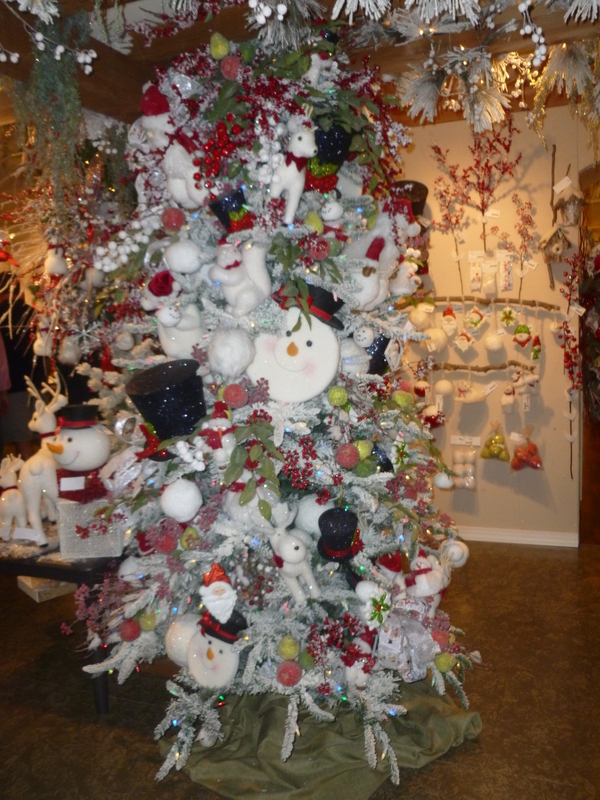 Here are more of the Christmas trees that caught our eye from the showrooms and designers we love! We created the Show Me Decorating app “Recipe for Holiday Decorating” to show everyone the basic steps to decorating your Christmas tree like a designer! 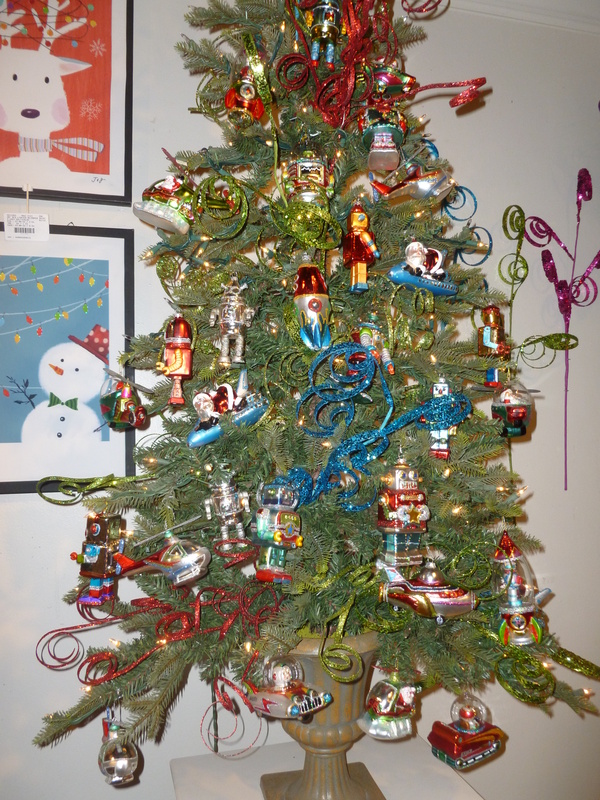 Learn how to tie a bow, theme your tree, and decorate! 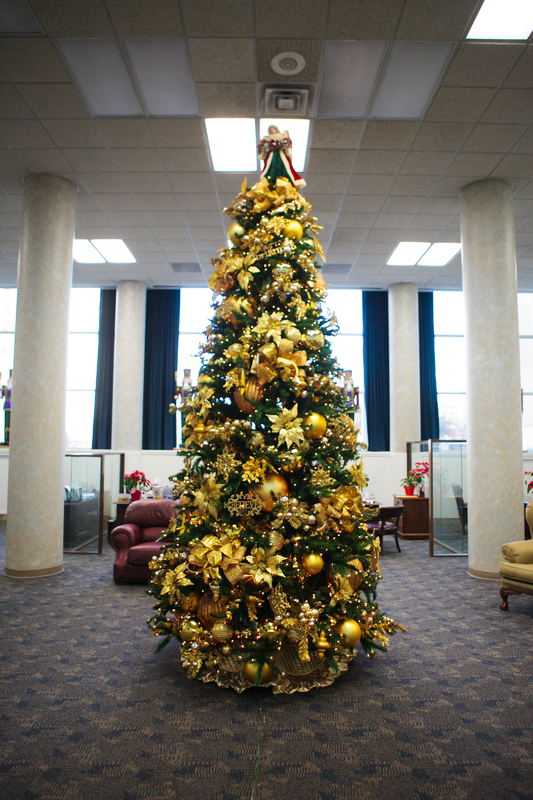 Go team Christmas go! 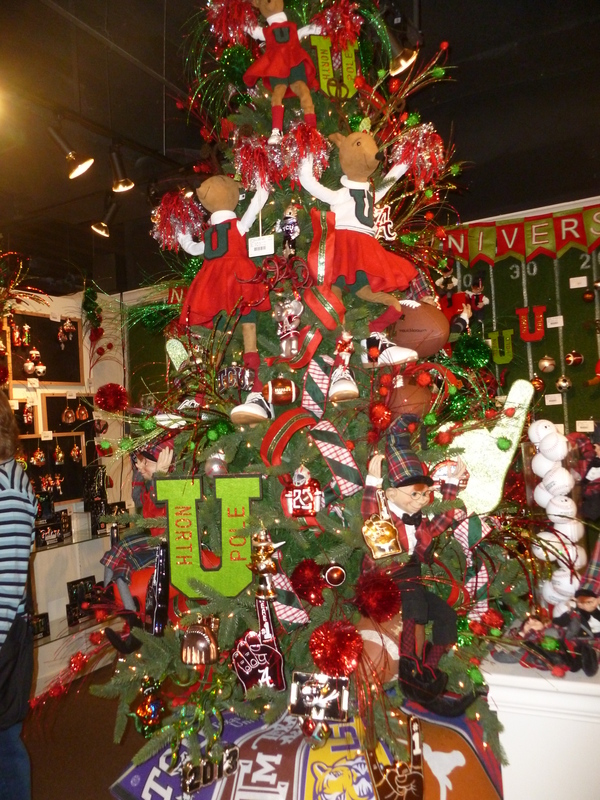 Sports Christmas tree theme, reindeer cheerleaders, collegiate teams, UT hook ’em Horns, Gig’em Aggies Texas A&M, TCU Horn frogs, LSU, Alabama, courtesy of Raz Imports. Put on your top hat! 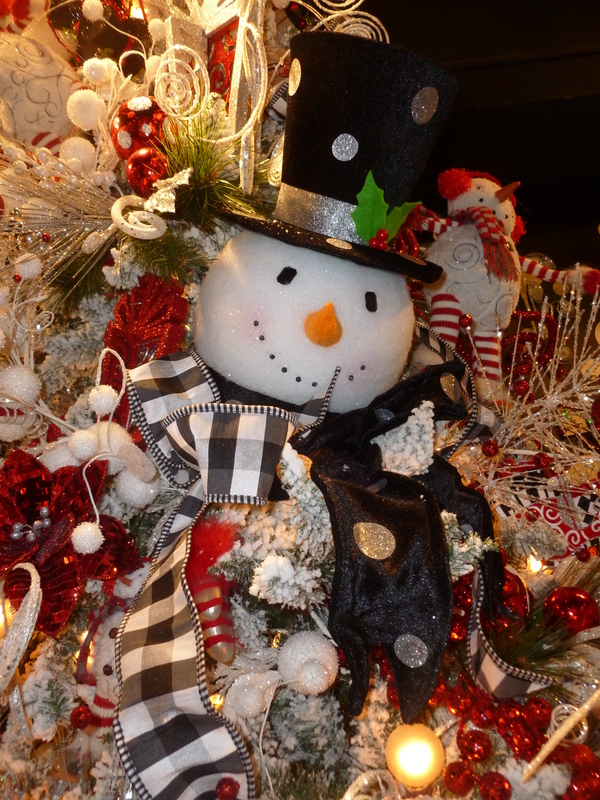 Frosty and friends Snowman Christmas tree theme, the oversized snowman head is accented with a black top hat, and black and silver glittered polka scarf. Did you have a favorite? As you can tell it is tough to choose! 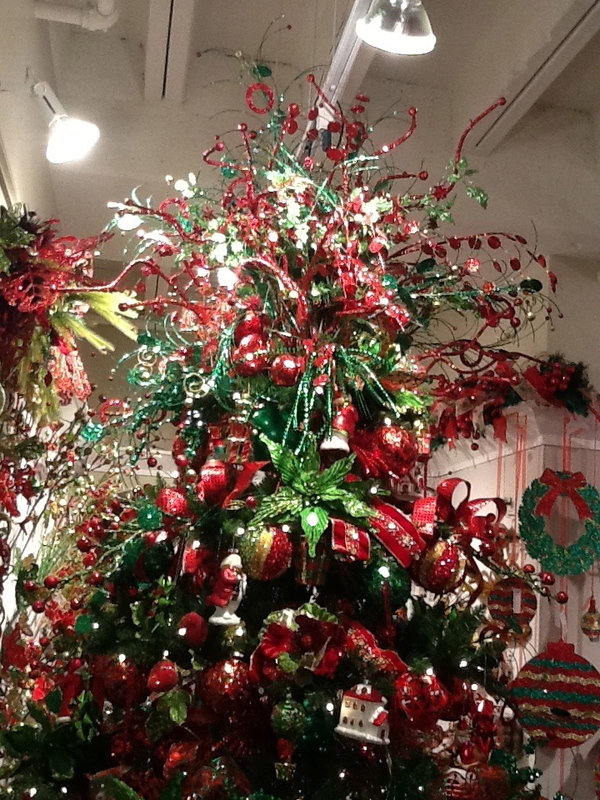 We feel so blessed to see such great designers and artist willing to share their talents and abilities in Christmas and holiday decor for us to choose from. 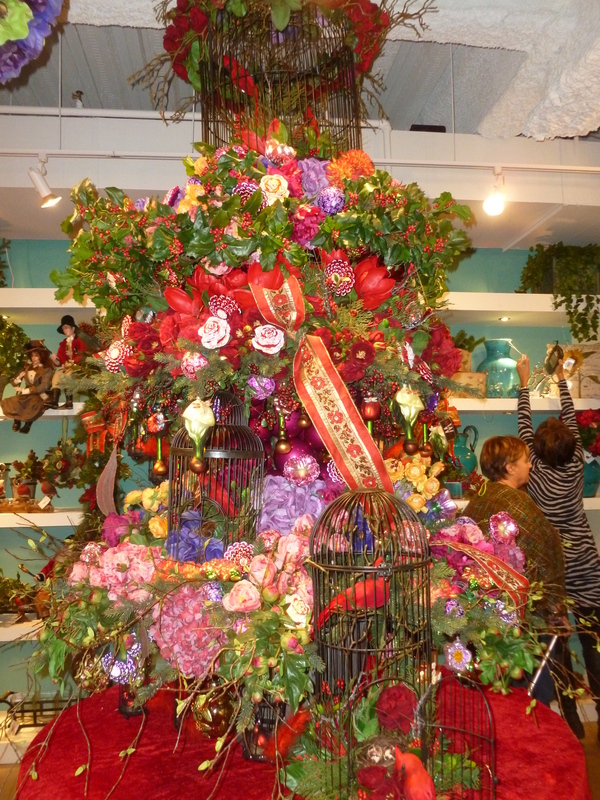 We start each Christmas tree for our store, website and the new season with an inspiration. 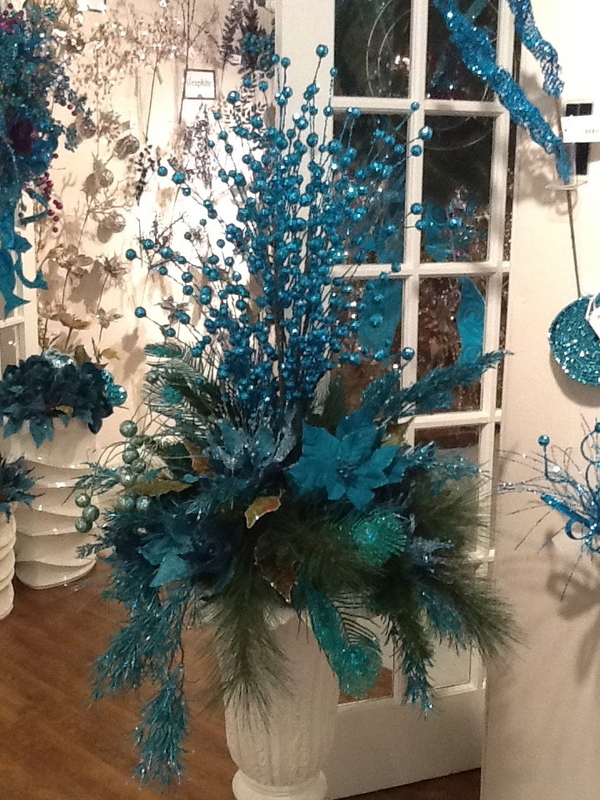 We develop a theme and color story and the buying process starts. The Show Me Decorating 3 key ingredients ribbon, balls, and florals are the backbone for each theme. 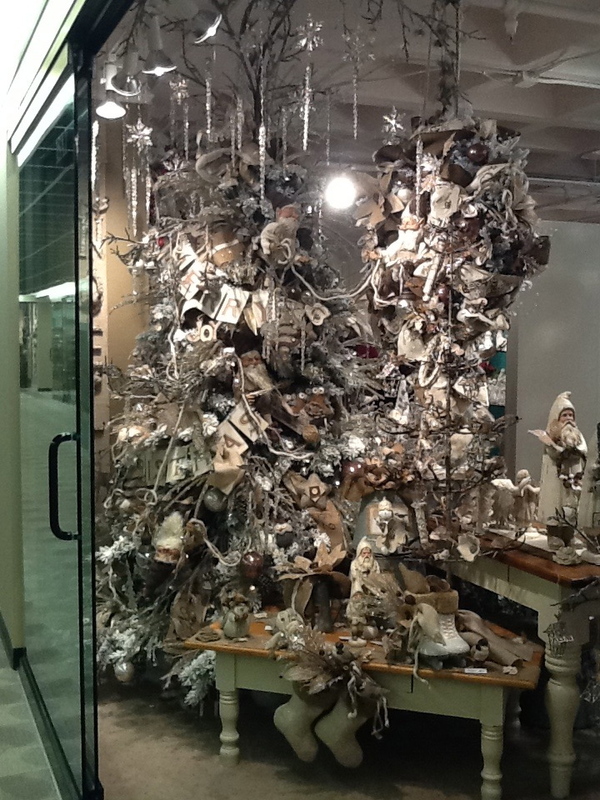 Collections of Christmas ornaments, Christmas decor, figurines and focal points are all chosen to support and complete the theme. 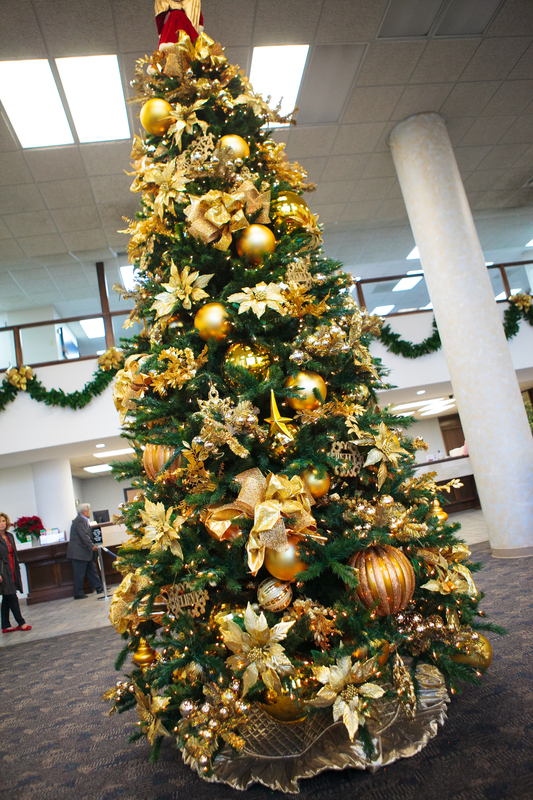 We can’t wait to show you all the New 2013 Christmas tree themes! Everyone is working really hard to get everything done at our new location at Western Park Plaza so that we can open our doors on September 6th. Becky and Kathy pitched in by doing a little moving of their own and then met with the Brad Hanlan of Hanlan Homes to get a status update. Next items on the “To Do List”, are floors and ceilings. Moveable walls at our new location??? I think YES! Becky and Kathy described their idea to Brad and he built us some! Can’t wait to see how these look finished with wreaths and garlands on them. Simply sensational is this sophisticated blend of gold, rust and turquoise. Pheasant feathers and animal print provide a striking accent. The bold peacock blue is a welcome contrast to the earthy tones and black trim in this lovely room. 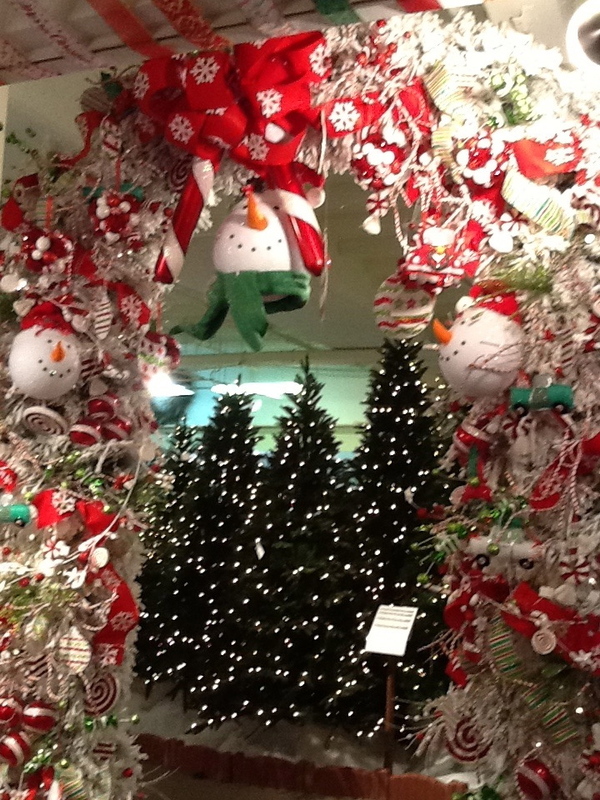 Twin wreaths on the front doors invite guests in to see this spectacular tree that’s proud as a peacock! The garland on the mantle reflects the trees gorgeous decorations and colors along with the animal print stockings trimmed in black fur. Traditional with a wow factor! 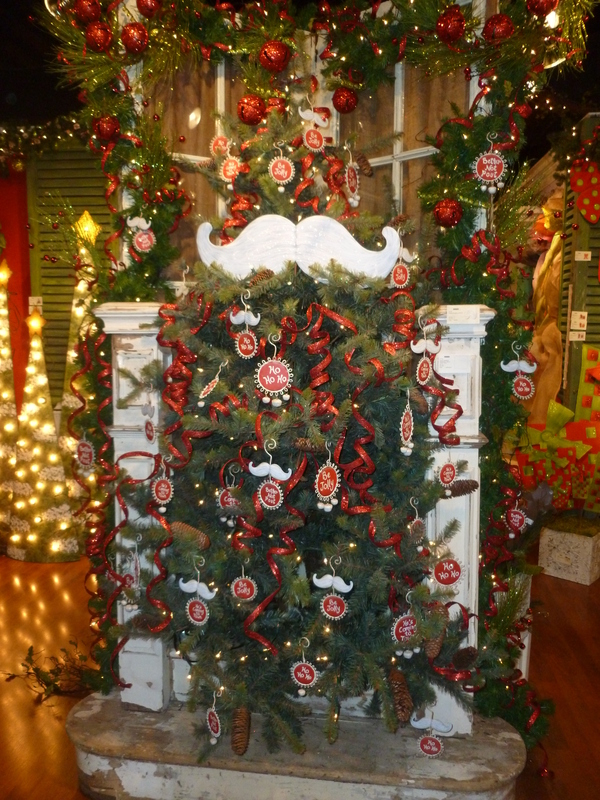 Cherished family ornaments are mixed with lime green and red flocked ribbon and balls. 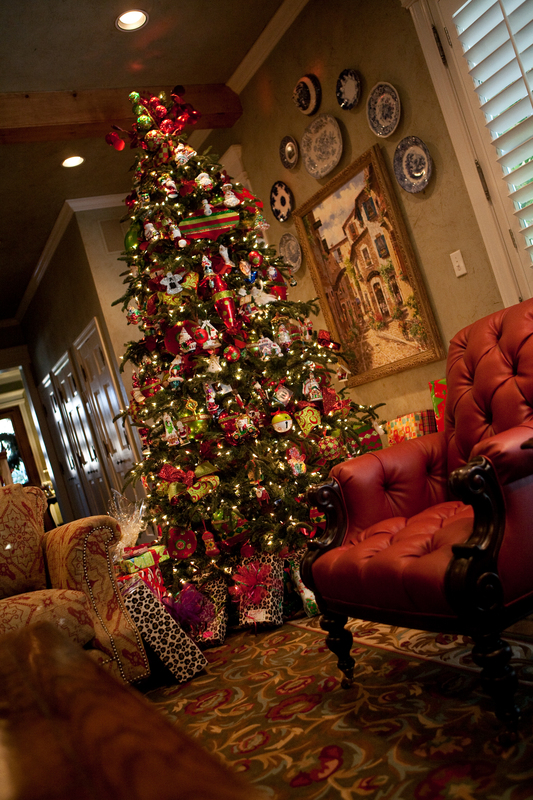 Christmas green and animal print patterned packages add a whimsical touch in this beautiful country French family room. 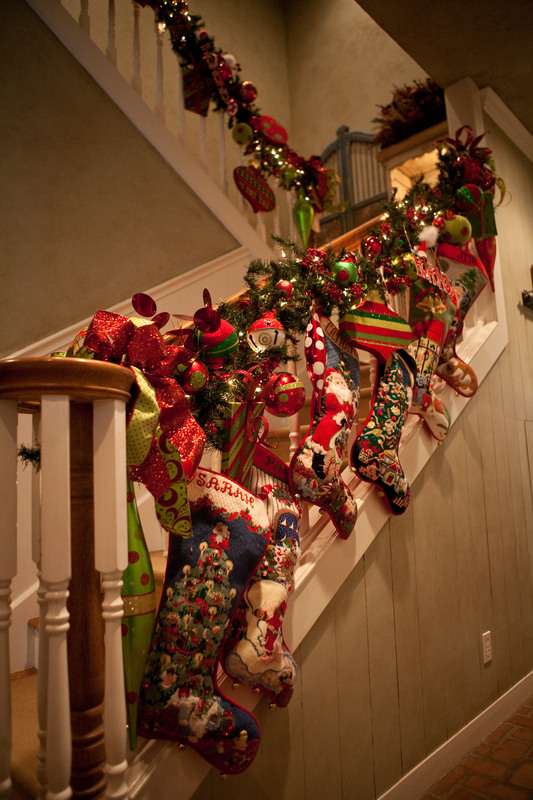 Children’s stockings are hung from the decorated garland on the staircase railing. 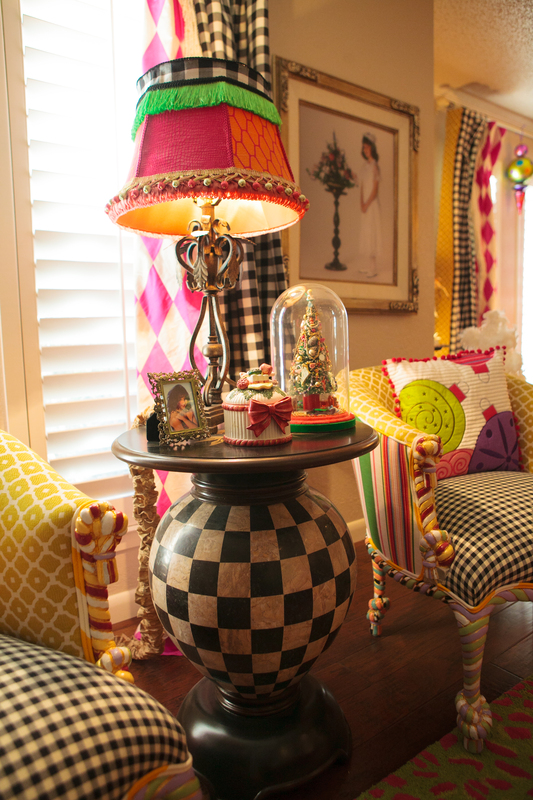 Oversized ornaments are added for fun along with the mixed print ribbon, balls and floral for a coordinated holiday look.